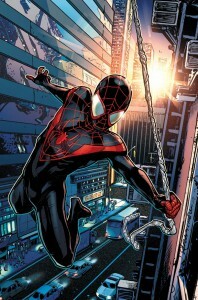 Ultimate Comics: Spider-Man #1 is a strong first issue for the series. It introduces the principals, their conflicts and a fair share of mysteries. It’s perfectly couched in the Ultimate Universe without getting mired in its history and for that I’m very thankful. I have not read anything from the Ultimate line since 2005 and only gave this a chance because of the month of newness we’re experiencing. 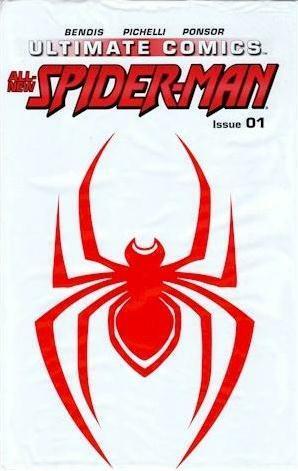 That publishing line has been through a lot of changes lately, but it’s just familiar enough that anyone with even just a passing knowledge of any Spider-Man continuity will immediately be on board. It’s straightforward and as a modern first issue there wasn’t really a panel to complain about. The debut of this series and the new Ultimate Spider-Man, Miles Morales, has certainly been the subject of a lot of media attention and is by no means flying under the radar. 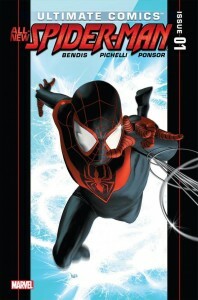 I’m perfectly willing to accept a new Spider-Man in the Ultimate Universe after the death of Peter Parker, and writer Brian Bendis has created a fine character to fit that bill. We get just enough of his family and their situation to make you want to know more. I generally like Bendis’ work but he’s definitely missed the mark with me at points. I can honestly say that this time, even with all of the first issues I’m reading lately, this is one of perhaps two titles that I’m tempted to continue with. Sara Pichelli’s artwork is rock solid and perfectly suited for the book. I haven’t seen a lot of her work, but I really enjoyed the pacing and layouts. I also thought the shadows set the mood and worked really well throughout the book. The opening scene is some great comics work and immediately drew me into everything that followed. The only thing missing was the new Spider-Man in action, but the lack of spandex is more than made up for by Pichelli’s ability to draw realistic people in realistic clothing and environments. I was able to pick up a variant cover edition of the book that features her Spidey swinging into action and it’s a beautiful glimpse of what’s to come. The hype around this release should see it get into a lot of readers hands. It’s one of the first Marvel titles to do “day and date” print and digital release, giving it even wider distribution. My only complaint is covering up the regular cover with opaque polybagging. I didn’t like the gimmick twenty years ago, I didn’t like the clear bag on the Justice League #1 combo pack last month (though I get that it was done to protect the download code printed inside), and I don’t like it here. Covering it up may add to the mystique of this book, but I much prefer seeing a dynamic image that’s part of the product to draw me in. Particularly when what’s inside is a very satisfying debut.